On 26 September, 1854, a certain Aaron L. Hatfield of Lewisburg, Pennsylvania, took out a US patent №11726 for machine for adding numbers. There is another calculating device from the time, made by another Hatfield, Jehu, from Glens Falls, New York, patented as Machine for calculating interest in 1844 (US patent №3574), but it seems there is no relation between them. Hatfield's Adder was in production for some years by the inventor himself (see the lower photo), and several devices survived to the present time. 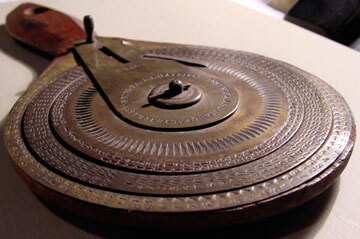 The calculator of Hatfield (see the lower drawing from the patent) was made by wood (mahogany), iron and brass, with dimensions 2.5 cm x 24.5 cm x 14.5 cm. It was a adder with carry and consists of a series of circular metallic disks having numbers stamped thereon, so arranged, in connection with springs, that by alternative movement of a lever, any number of figures, from 1 to 10000 or more, may be correctly and easily added together before the eye. The adding device is mounted on a mahogany base plate in the shape of a handheld mirror. There is a hole at the end of the handle for hanging the machine. The calculating mechanism consists of three, concentric brass discs of different diameters, that are mounted on one top of each other and to the mirror portion of the mahogany base. 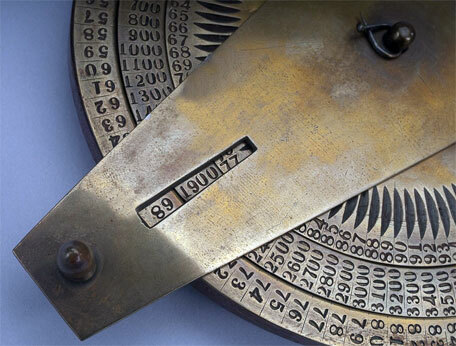 The largest disc is fixed to the mahogany base, and it has the numbers from 1 to 99 indicated around the edge (there also is a blank space for zero). The middle and upper discs rotate about a central pivot, which has a smaller pin attached to it that holds the discs together. The middle disc is divided into 100 parts around the edge, with the parts numbered from 100 to 9900 (again there is a blank division). The top disc has the numbers from 1 to 99 around the edge, as well as a blank. Next to each digit of the disc there is a small sunken tooth in the disc. A hole in the arm allows one to see numbers on the discs. To use the instrument, the operator sets up thousands by rotating the middle disc. There is an iron handle at the very end of a cross bar (attached to the common center of the discs), with which the operator rotates the bar. To add one or two digit numbers, the operator moves the arm counterclockwise so that it is over the desired number on the outer rim. Then, rotating clockwise back to zero, a spring-ratchet attached to the arm engages a tooth on the inner disc and rotates it through the number set up. When the inner disc goes a full revolution, a carry mechanism advances the middle wheel one unit. There is also a thin iron bar coming off of the side of the cross bar. The other end of this bar fits in the engraved wedge-shaped grooves around an inner circumference of the topmost brass disc. This bar permits the cross bar to be rotated only counterclockwise. So, who was the inventor Aaron Hatfield? The information for him is very scanty, found mainly in US census databases. Aaron "Aron" L. Hatfield was born in Pennsylvania in 1819 and is listed in the 1850 US Census as living in Lewisburg, Union County, Pennsylvania. By then he was 31 years old, had a wife and two children, and worked as a watchmaker. The next US Census in 1860 lists Aaron L. Hatfield as 40 years old, born in Pennsylvania and living in Green Springs, Sandusky, Ohio. By then he worked as a photographer (ambrotypist). No family is listed. The 1880 US Census lists an Aaron L. Hatfield, 61 years old, widowed, and a watchmaker, living in Constantine, St. Joseph County, Michigan. Aaron Hatfield died on 9 December, 1898, in Three Rivers, Michigan, where he hold a small jewelry and musical instruments store. Last years of his life he was living a secluded life above his store. In addition to the patent for the above-mentioned machine for adding numbers, Aaron Hatfield took out three other US patents. The US patent №103327, was for an improvement in pruning shears, and was taken out in 1870, when Hatfield was living in Clyde, Ohio. 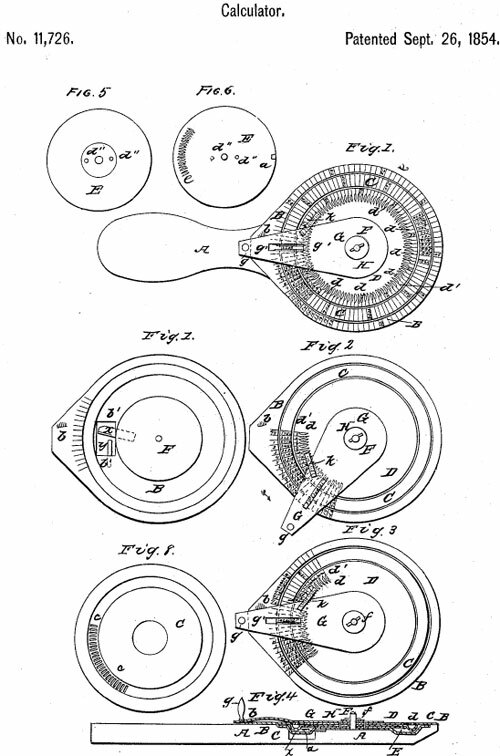 The next patent №143759, was for an improvement in pumps, and was taken out in 1873, when Hatfield was still in Clyde. The last patent №199705, was for an improvement in bag holders, and was taken out in 1878, when he was living in Constantine.